Well, he would have a field day with Indian taxi drivers, or come to that, anyone courageous enough – or stupid enough– to get behind a wheel on Indian roads. There are basically two modes of driving. One: full pelt ahead. Two: slamming on brakes. Yet, I am astounded by how skilful these drivers are at avoiding collisions (although the death toll on Indian roads is horrendously high). I say this having survived a mad six-hour taxi drive from McLeod Ganj to Amritsar, followed by the taxi journey from Amritsar to the Wagah border for the frenzied evening ‘lowering of the flag’ ceremony, where Indian and Pakistani soldiers blow testosterone-fuelled raspberries at each other as they pack up shop for the night. But let’s start with the taxi drive from McLeod Ganj. I wasn’t in the best of moods anyway, because I had lost my passport. After going through my bags for the umpteenth time, I gave in and started to plan a visit to the British Embassy in Delhi, involving much inconvenience and expense. But after climbing into a small, rickety taxi with two other IVHQ volunteers at six o’clock in the morning, I forgot my woes when I spotted that the driver was having problems staying awake. 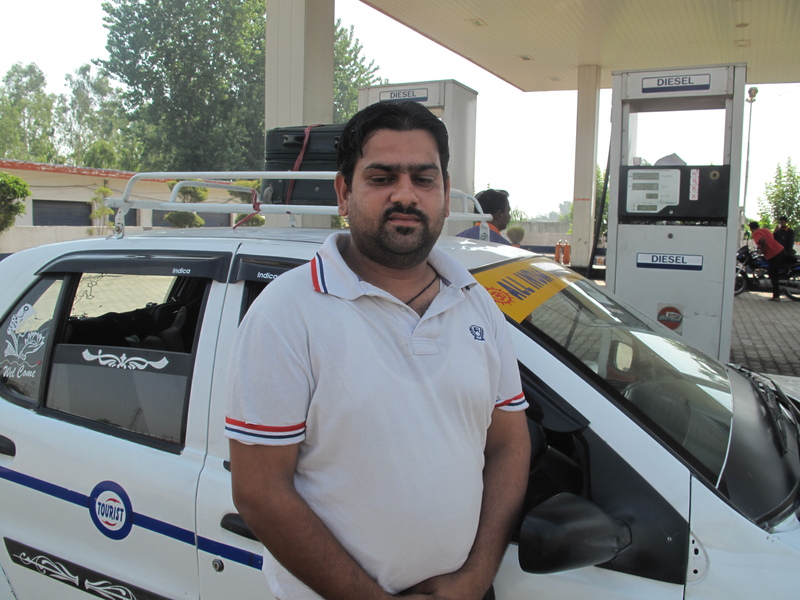 We found out that he had already driven from Amritsar to McLoed Ganj overnight. This was his return journey – which meant he probably hadn’t slept for twenty four hours. To keep himself awake as the car lurched round hairpins bends on the way down the mountain, he drove with his head sticking out of the window. When the bends veered the other way, his head almost landed in Wei’s lap – a twenty-year-old Chinese volunteer, bravely sitting in the front seat. But, I guess even he realised he was beyond his capabilities. After a few mobile calls, made as he dodged between thundering lorries throwing up dust storms in our path, we screeched to a halt in Parthankot, a rundown town in the middle of nowhere, where he handed us over to another driver in a different car. There is a remarkable difference being driven by someone who is falling asleep and someone who isn’t. Even though we were still going at break-neck speed, our new, and thoroughly delightful Punjabi driver merrily chatted away in sketchy English, and somehow got us safely to Amritsa and to comfort of the Savorar Regency hotel. I went straight to the shower to wash half of India’s dust out of my hair, before meeting a group of IVHQ volunteers for lunch, who had also arrived to visit the Wagah border. Deepak, the manager of the Misty Woods hotel where I had stayed in McLeod Ganj, called me to say he’d found my passport down the side of the chair where I had been sitting in reception. He was sending it express to the Anoop Hotel in Delhi, my next port of call. 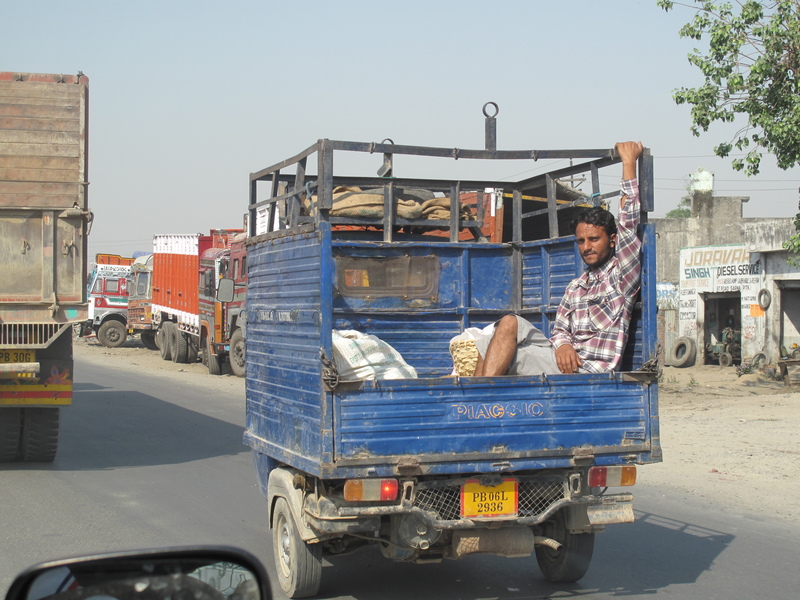 I was so relieved that I barely considered the perilous taxi ride to the Wagah border. But at one point I did say goodbye in my head to everyone I knew, as a car, without a care in the world, cut straight across our path. Completely unfazed, our driver did a nifty swerve, and on we roar. 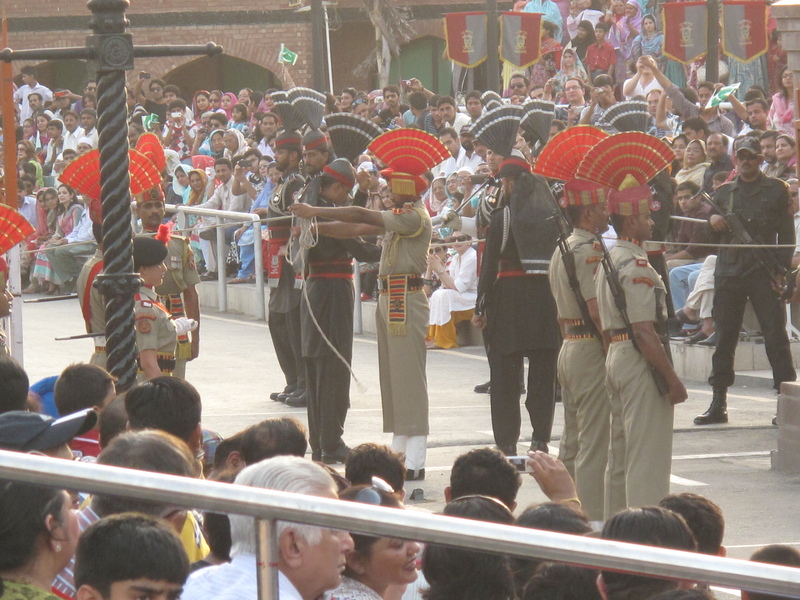 It’s difficult to know how to describe the full flavour of the Wagah border ceremony to anyone who’s never been. But I’ll give it a go. In searing temperatures of 42 degrees, I guess it’s like being in a vast, unruly, horribly sweaty football crowd without armies of police and football marshalls to keep order, or, come to that, St Johns Ambulance to call on when things get out of control. It starts with hordes of men, women and children crammed up against a closed gate, waiting for it to open so they can race to the best place on the stands to see this nightly spectacle. 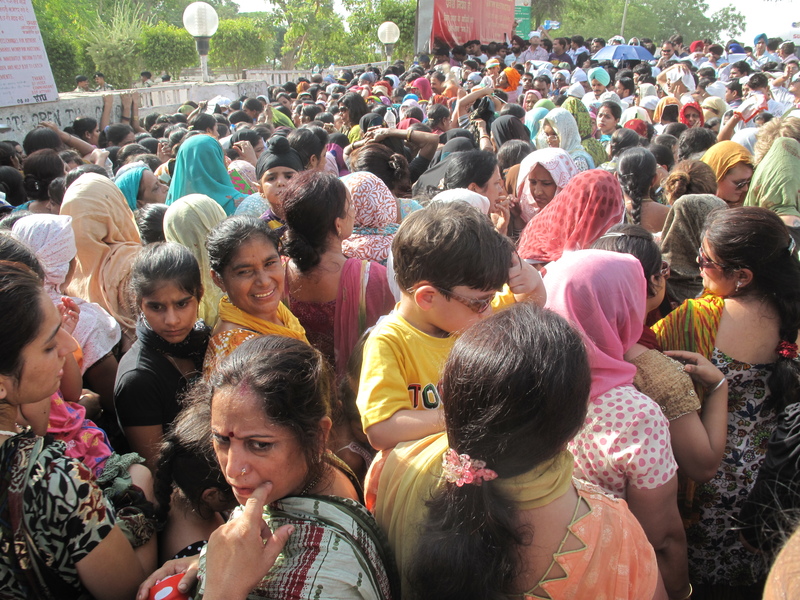 For some reason the Indian soldiers, who are meant to be maintaining order, decide to open a side gate to filter through some of the women and children. The only problem is that everyone else makes a dash for it, creating a bottleneck of heaving humanity. A Canadian woman and I are crushed against the wall by the seething throng, and I realise how people die like this. It is certainly one of the most dangerous situations I’ve ever been in, and it is awful to see tiny children screaming in terror. Somehow we make it through gate to find ourselves in a wide leafy road where women are separated from men for security checks. Once the body search is over, we are ushered into the VIP tourists’ stand which promises a great view of the proceedings. In the meantime, thousands of Indians are settling into their own stands for the time of their lives. On the other side of a huge sturdy iron gate, flanked by large pillars, is Pakistan. I can see similar seating beginning to fill with a much smaller, and far quieter crowd. Patriotic Pakistani music starts up on loudspeakers. The Indian side counter-attack with even louder music. The crowd roars in approval. 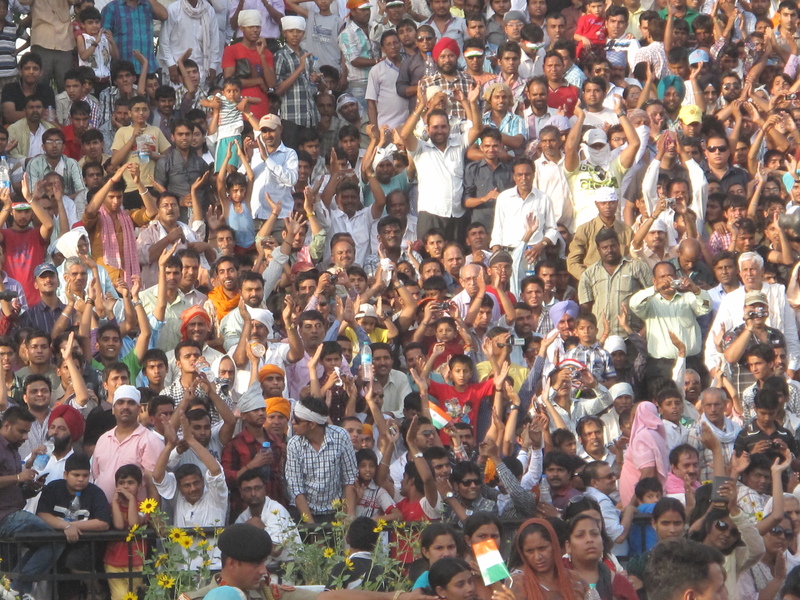 Microphone in hand, a tall, handsome Indian, dressed in what looks like cricket whites, eggs everyone into a frenzy. Women start dancing. Men begin to chant, shaking their fists in defiance at Pakistan. People run up and down the parade route waving huge Indian flags. Indian soldiers arrive, dressed immaculately, and wearing absurd red cockle-shaped hats with a lot of gold braid dangling into eyes. They strut up and down the parade route (which has had to be cleared yet again of enthusiastic Indians), seeing who can do the highest kick as part of their outlandish routine. Eventually, the border gate is drawn open. The crowd goes completely wild. 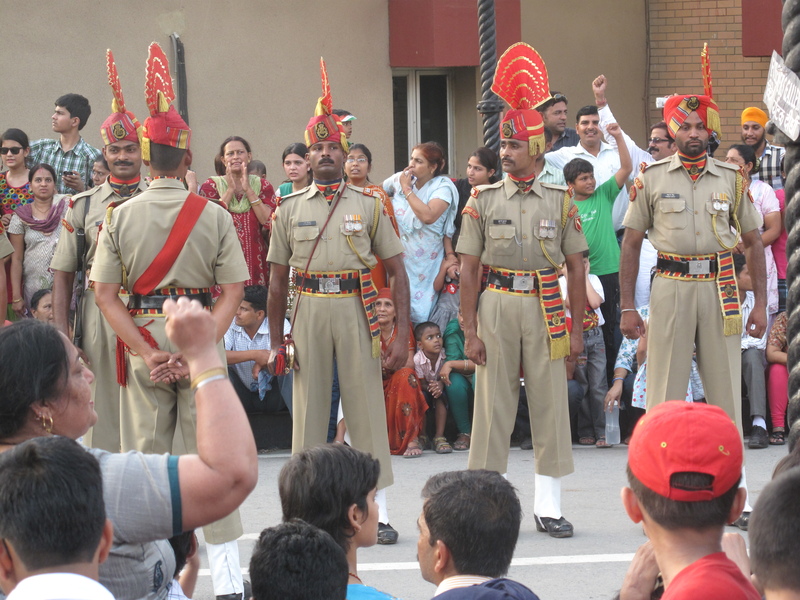 Indian and Pakistani (dressed similarly in darker colours) soldiers confront each other and after much posturing and high leg-kicks on both sides, they lower their respective flags. More hysterical screaming, yelling, and shouting from the Indian mob determined to drown out the Pakistani crowd who are giving it their best. The gate clangs shut, and it’s over for another night. Exhausted but happy, the crowds disperse, leaving the soldiers, or their lackeys, to clear up thousands of empty plastic water bottles, and to prepare themselves to do it all again tomorrow. We clamber back into our taxi, and off we set to Amritsar. An hour later, after more death-defying driving tactics, we are delivered back to our hotel, safe and sound. I crawl into bed grateful to be a live and unscathed, and swear I will pay much more addition to my own driving habits when I get home. This entry was posted in All posts and tagged Amritsar, Indian taxi drivers, IVHQ, Wagah Border. Bookmark the permalink. Love you post, Sue. It reminds me of things more than that I have been aware of in a wonderful way. ————–Wei. Love to see those Indian driving habits in Cirencester! Hi Sue – just a quick hello. Sounds as if you are having some great adventures! Keep it up!